This Wednesday, April 13th at 7:00pm in Dewey 1101, SBAI will be hosting a screening of the documentary-in-progress Shoulders to Stand On as part of our Out in Reel: LGBTQI Awareness Month Film Series. Please join us tomorrow in welcoming filmmaker Evelyn Bailey who will be screening clips from Shoulders to Stand On, a production of the Gay Alliance of the Genesee Valley. 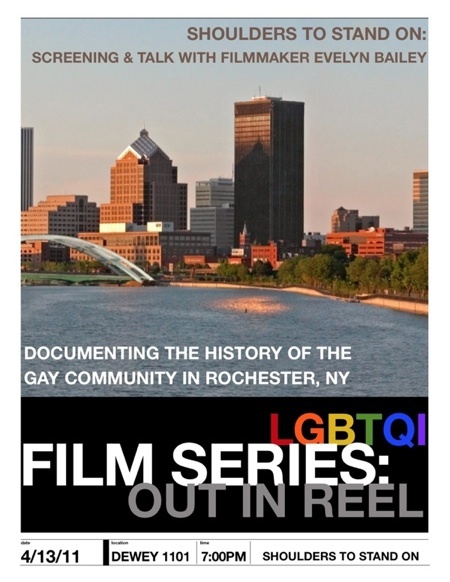 This documentary will chronicle and safeguard the history of the LGBT community in the Rochester region. Check out our events page for more details. Don’t forget to mark your calendars for the other films in our Out in Reel series! The double feature of Straightlaced and Outlaw will screen next Wednesday, 4/20, and Two Spirits will screen the following Wednesday, 4/27. All screenings in this series are located in Dewey 1101 at 7:00pm on River Campus and are free, open to the greater UR community, and include snacks. All UR events scheduled in recognition of LGBTQI Awareness Month can be found here.